Earn $2.81 in VIP credit (281 points)What's This? 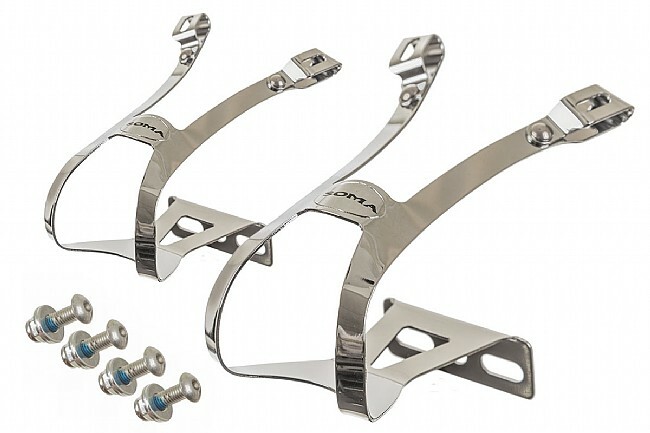 Chrome double-gate toe clip set. Includes nuts and bolts for mounting to pedals. S/M (up to US Men's 9) or L/XL (US Mens 9 or over). Sizing subject to personal preference and shoe design. NOTE: Does NOT include toe straps sold separately. I purchased the LXL size since my feet would occasionally slip on the pedals. Now my feet are more secure on the pedals and I can crank with confidence. toes slip in easily and grip nicely.